music building | Music Matters | Because it does. Doesn't it ? 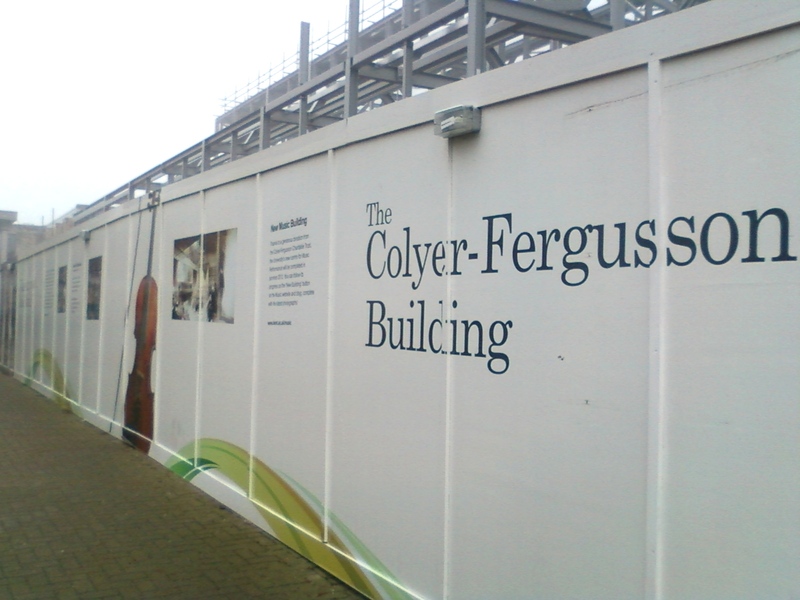 Since Friday, the hoarding around the construction site of the new Colyer-Fergusson music building has taken on a different aspect – it now features several giant photographs taken by the illustrious photographic arm of the Music Department, Mick Norman. 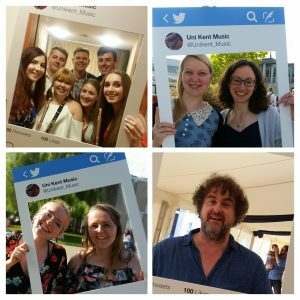 Walking from the visitors’ car park to the Gulbenkian, visitors will be greeted with images of music in action – the images feature some of the Music Scholars performing – as well as information about music at the University. I’m delighted to see that we’ve been given a double-page spread in the latest issue of the University magazine; the feature includes a review of last year’s Music Scholarship prize-winners; a focus on Humphrey Berney’s musical success after life at Kent; a look at the latest on the Colyer-Fergusson music building; and a look ahead to the last ever concert in Eliot Hall! (I know, but, as a Frasier fan, the opportunity was too good to resist, surely ?). 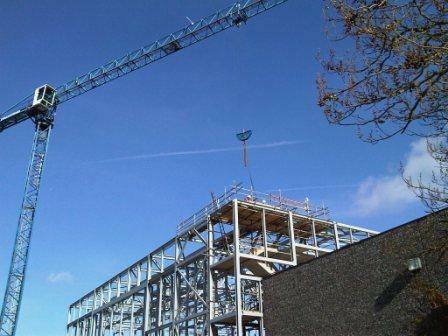 The construction site for the Colyer-Fergusson building has this week sprouted a monstrously large crane, which is apparently visible even from the foot of the hill, down by the city. With the installation of the main staircase, which will link the foyer and reception areas to the first floor of offices and rehearsal rooms, photos from yesterday’s site visit to the construction of the new Colyer-Fergusson music building are starting to give a real sense of the shape of things to come. 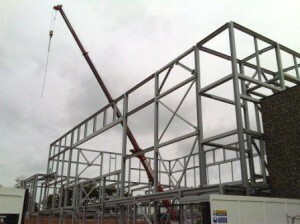 As yesterday’s photograph of the work on the new Colyer-Fergusson centre for Music Performance shows, the fourth wall is now in place, outlined by the steel girders. This gives a clear delineation of the eventual space the hall will occupy. The skies may be grey overhead, but the outlook is bright. In the heat of the summer holiday season, things are hotting up with the new centre for Music Performance; the steel girders are beginning to define the outline of the new building. Exciting times! Open Day: live from the stand! The Director of Music arrived with bags of sweets to sustain us throughout the day, and has already had her first cup of coffee; it’s always important to know when the tea-booth has opened. 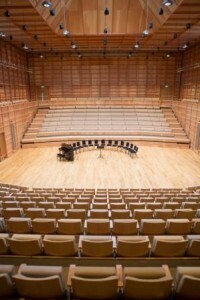 We’re looking forward to a stream of visitors interested in making music and the Music Scholarships. We’ll keep you posted throughout the day as to how it’s going, thanks to wireless technology here in the Sports Hall. 10am: an hour in, and we’ve seen ten visitors and their families, coming from Norfolk, Surrey and elsewhere: the prize for the visitor who’s travelled the farthest is currently held by someone from Swansea. The Director of Music is celebrating a short lull by cracking open the ‘Revels’ as I type, and I’m going to grab my first cup of tea – I wonder if there’s any Earl Gray ? 11.45am: I’ve only just managed to get the tea (no Earl Gray, alas) as suddenly there was a swathe of visitors from especially far-flung corners of the globe: the number of people arriving at the stand has now risen to thirty three, with a particularly international appeal: the record for Visitor From The Farthest Place has now been smashed by someone from Hong Kong, although there’s competition from people from America and Italy. And I thought Kent was the UK’s European university ?! 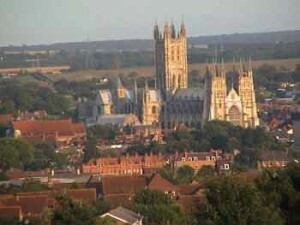 2.15pm: visitor numbers have now reached over sixty, coming from Bucks, Berks, Harrogate, Leicester and Hampshire. With only forty-five minutes left, the end is in sight; our voices are starting to tire, but morale is boosted by the chocolate biscuits the Director of Music is about to open… There’s a definite sense that music is becoming an increasingly attractive provision for students making their university choices, wanting to continue with making music and taking instrumental or singing lessons alongside their formal degree programmes; with the new music building set to open its doors shortly before these visitors would arrive as first-year students, they’re in for a fantastic time. 3pm: and that’s it. Final count 67 visitors, including several more from Oxford, Windsor, Kent, and one from Sweden competing for the Farthest Distance Travelled. The winner must be the one who came from Hong Kong, surely ? Thanks to everyone who came to the music stand today, we’ve met a great many interesting and talented musicians: safe journeys home to all. We’re signing off: see you all again.